The Dodd Center was deeply saddened to learn of Dr. Sackler’s recent passing on July 17, 2017. His obituary in UConn Today can be read here. Dr. Raymond and Beverly Sackler established the Raymond and Beverly Sackler Distinguished Lecture Series in 1993 to invite scholars, activists, and distinguished experts from around the world to discuss critical human rights issues. The Sackler’s numerous philanthropies include support for galleries and wings at the Metropolitan Museum of Art and the British Museum, the establishing of laboratories and programs at the University of Cambridge, Tel Aviv University, Cornell, Columbia, Yale, Duke, Tufts, and New York University Schools of Medicine, Rockefeller University, Memorial Sloan- Kettering Cancer Center, Institute for Advanced Study (Princeton), Institute for Advanced Scientific Studies (France), and support for archaeological projects in Israel, Syria, Iraq, Egypt and Belize. Raymond and Beverly Sackler have established lecture series in the biomedical sciences and in the physical sciences and mathematics at Harvard University, University of California-Berkeley, Albert Einstein School of Medicine, Canadian Institute of Theoretical Physics at the University of Toronto, the Niels Bohr Institute at the University of Copenhagen, the University of Oslo, and Tel Aviv University. Dr. Sackler received his bachelor of science degree from New York University. He received his doctor of medicine degree from the Middlesex School of Medicine. Doctor Sackler is a diplomate of the American Board of Psychiatry and Neurology (P) and a Trustee of New York University Medical Center. He is president of The Purdue Frederick Company, a pharmaceutical research, manufacturing and distribution company located in Norwalk, Connecticut, and a founder of pharmaceutical corporations in Great Britain, France, Germany and Canada. Dr. Sackler has been honored with an honorary Doctor of Philosophy degree from Tel Aviv University, is a Life Fellow of the American Psychiatric Association, and an Honorary Fellow of the Institute of Astronomy at the University of Cambridge. 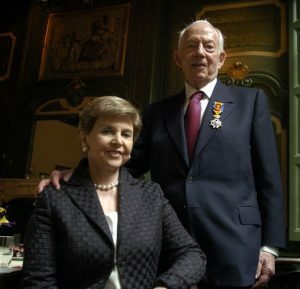 Dr. Raymond Sackler was awarded the Chevalier de la Legion d’Honneur ( France) and Knight Commander, Order of the British Empire ( United Kingdom). Dr. Sackler passed on July 17, 2017 after a brief illness. He was 97 years old.